As you can see it is designed to replace one of the number plate illumination lamps under the rear plate trim, it fits the into the hole left by the original lamp once its removed and needs very little modification to fit. The video signal output from the camera gives is NTSC but causes little problem to auto video monitors as most are auto-switching PAL or NTSC system formats so this was not a concern. It is already image reversed so there is no need to worry about the image appearing backwards on the viewing monitor and if used in place of rear view mirror the image appears just as it would in a standard mirror. There is a nice added bonus that the video signal has a distance grid superimposed on the rearward image, this means you have two visible guide lines either side of the picture (zoned green, amber and red in colour) to assist you in knowing how far you are away from an object. The viewing angle is 170 degrees, this gives a very wide angle view indeed almost fanning the complete rear of the vehicle. The bumper and area around it can be easily be seen and to be honest the ‘fish-eye’ vision effect is quite minimal. This camera was installed in theVito ‘twin, barn door model’ where although the camera is slightly offset to one side of the vehicle it’s hardly noticeable, I would imagine when used in the single tailgate model its centered vision would be slightly improved as it would lie closer to the centre line of the vehicle. Night time colour vision is very good, especially when reversing lamps illuminate the area behind, daytime vision is super clear and little noise is apparent in either darkness or poor lighting situations – Remember this is not HD TV – its a visual reversing aid! Here is the rear view in complete darkness, illuminated as it would be with only the van reversing lights. This image is shown without the displayed reversing guide bars. 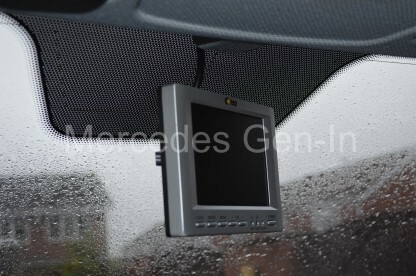 Here is a photograph of the monitor installation where the rear view mirror would be located in a rear windowed vehicle. The fact that the mirror mount was there and already fixed to the glass unused, made a perfect mounting option in my case. The monitor I used was a used ‘Back-View’ 5 inch automotive monitor adapted to fix to a standard rear view mirror ball arm. Wiring runs beneath the headlining and just pops out infront of the interior light, straight to the monitor. 12V power was obtained from behind the glove-box from its interior lamp supply. This was great as it was only live when the ignition was on and provided both positive and negative connection with little fuss. The camera supply was taken from the reverse light cluster wiring at the rear. I tapped off the main loom using an inline fuse holder with a 2A fuse for protection if anything ever went wrong with the camera. Video cable was run the full length of the van in the box section body void that runs the full length of the vehicle front to back, the video wire enters above the rear light body section and runs along through the top of the roof line past the sliding door upper frame, rail runner and appears just above the passenger door where it then exited behind the plastic trim, into the headlining and out to the monitor. I used a steel fish wire pushed from the front door end to the rear, attached the cable and then withdrew the fish wire pulling the thin video cable unseen, neat and tidy along the concealed section. The only tricky part was threading the video and power cables through the rubber cable condiut that is attached to the rear door. It is possible but just takes a little time to fiddle the wires through, once done it makes a really professional job of the installation as everything is hidden with no trailing wires. You could I am sure get a similar holder for the bulb from a scrap yard or breakers for virtually nothing, once you know what to look for ! The bulb that fits this type of holder is a standard 12V 501 / T10 5W sidelight bulb. Once the correct parts are obtained, cut off the original mercedes lamp holder from your Vito leaving long enough wire tails to rewire it should you ever need to refit it. – (Keep it in a safe place !) The only other related job that was done was to mask and spray the rear of the video monitor matt black (originally silver) to reduce its visibility both in reflection terms and to casual viewers. In fact the fact that the monitor is where the rear view mirror would usually be placed makes use of the natural masking and tint of the screen in this area to oscure it from sight. 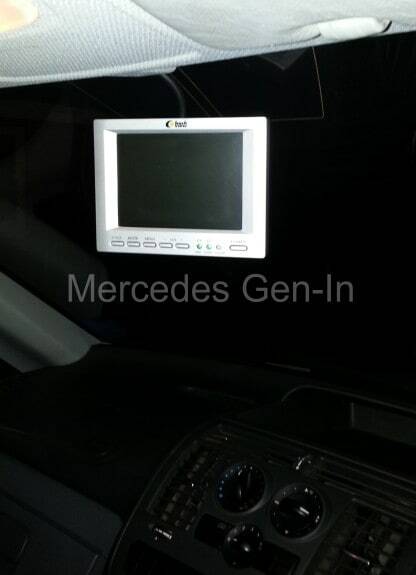 If you have a Vito that has rear glass or own a Traveliner, then I would suggest looking at the video monitors that combine a traditional rear view mirror and an LCD video display. You can find many examples of these on the on-line auction sites with a simple search. I will include some more pictures once its light enough to take them. A very useful modification and quite easy to do with limited funds. You inspired me to install one on my 2012 Valente. Being a bit of an amateur, I could have used a few more details so I thought I’d send them in case anyone else needs them. Mine is a lift-up tailgate and the monitor I used is a rear-view mirror replacement from Elinz. To get the number plate light assembly off you need to remove the tailgate lining which has 2 screws in the grips at the bottom and a cover strip around the inside handle. After removing these, you need to pop off all the bayonet clips holding the lining. The light assembly is secured by 4 bolts and 2 clips. The camera/light fitted into the slot that held the left light without any need for alteration. I found a rubber globe holder ( http://www.supercheapauto.com.au/online-store/products/Sca-Universal-Globe-Holder-Suits-T10Mm-Wedge-Globes.aspx?pid=325157#Cross ) which has the advantage of using the original T-10mm wedge globe. It was easy to modify this holder to fit the hole in the camera/light fitting. I couldn’t get the camera/power wire through the rubber grommet into the door but did manage to get it through the rubber conduit from the door to the body with a lot of effort. Like you I attached the power wires to the reverse light cluster (Blue/White + and Brown -) and fed the camera cable along the inside of the roof. On my van there are 2 lights and vents along this path and I was able to remove the vent covers (2 star screws on each) which made it easy to feed the cable along in 3 stages. I used a length of stiff heavy duty power cable (as used in house wiring) and a plastic strip from tongue & groove timber flooring slabs. At this point I wish I had also fed the monitor power wires through here too because the mirror monitor needs to be switched off when not in use (so you can use the mirror without a big blue rectangle in the middle). The monitor/mirror clipped onto the rearview mirror and there was plenty of room in the roof above to hide all the cables. Initially I also attached the monitor power to the glovebox light (without hiding the wires) to test the system. I discovered that the monitor came on with the ignition and the camera came on when in reverse. Hiding the wires looked too difficult to me and that was another reason to run the monitor power wires back to the reverse light. I will only be using the monitor for reversing anyway. Many thanks for your guide Steve. I’m thinking of doing the same to my 639 and your intructions are the best I’ve seen so far. Rest of the site looks very useful too. Thanks for the comment Paul, good luck with the install. If you need any further info just ask ! These are the best instructions I have seen for how to fit a reversing camera in a W639! Just one question – what colour is the reversing lamp wire that needs to be tapped for the camera power supply? Rest of the site is good reading too, when is the next mod happening? Thanks for the feedback, glad you found it of use. The wiring colours for the rear light cluster on the W639 Vito can be found here, just pick up on the reverse light circuit and take that as your camera feed (White/Blue Wire). Obviously it only becomes live when reverse is selected. You can use an in-line fuse holder to protect the reverse circuit should the camera have a problem, this can all lie in the rear door behind the panel card. Correct!, as I mentioned in the text it does need a simple modification (a slot) in the door housing. I did mine with a pair of wire cutters and then pliers to break out a small square section. It was simple to do and actually quite neat, once this was done it simply fitted perfectly in the position furthest from the door hinge. Obviously I did not go into great detail with this, as if people were reading this in Europe/USA outside of the UK then the rear door configuration could be different and actually correct fitment for the part as supplied. Glad you found the post useful. Very clear instructions. I love this website. Thanks! 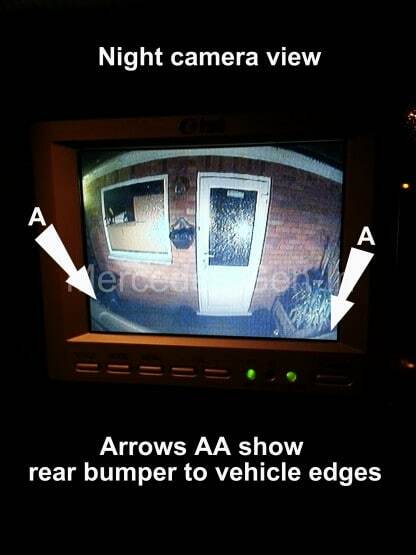 I find this brilliant as I am about to install a reversing camera and monitor on my Vito 639 . Ideally I only want the monitor to come on when I want to reverse. To achieve this, do I need to run the power wires from the monitor back to the reversing light. If so, this would mean that both camera and monitor would be connected to the same wires at the reversing light cluster. Is it OK to do this? If you wished to operate a standard 12v monitor to power up in reverse as well as the camera I would normally be tempted to use a relay on the reverse lamp wire from the light cluster and route an independent supply to the monitor that way, as the ‘bulb fail’ circuit may not like the extra load. Plus it would be far better to derive and fuse its power by separate means insuring that an expensive Body Control Module (BCM) does not go up in smoke thanks to a faulty monitor at some point further down the line. However it seems the monitor you have chosen has a sense wire. You must check this out on the wiring scheme that came with the monitor to be sure, but I am 99 percent sure that you can wire the monitor up front with an available 12v supply and then run a single cable connected to the sense wire to the rear lamp cluster and tap into the reverse lamp supply wire (remember to use an inline fuse holder and the smallest fuse you can get to protect it 0.5A would be good) This will then ‘auto-turn’ on the monitor when it senses voltage on this line. It draws little to no current, it just senses the presence of voltage appearing on the reverse lamp wire and turns on the monitor main power (utilising a transistor switch inside the monitor itself), turning it off again when the voltage ceases to be present on the sense wire. Depending on your choice of modern camera, they will all normally be very low consumption and should not effect the reverse lamp circuit in any way – at least it has not on the three I have done now. Do remember though to protect any supply taken from the reverse lamp circuit to the camera with a fuse, its value based on the current consumption of the camera. Hi Steve, thank you for the very helpful advice. The camera I have came from ebay. I would send a link but it wont seem to let me copy and paste the address. It says Video Output is 1.0Vpp and also750hm. Not sure if this gives a clue to the Ampage. The Monitor already has an inline fuse but you would suggest I would need two more. One on the Sensor Wire (0.5 fuse) and one on the camera wire. Then tap both these wires into the same reverse lamp supply wire? The info you gave on the camera is regarding the video output and is fairly standard. The idea of the fuses is to protect the connection to the vehicle electrical system and quite right, a fuse to protect the camera power and also the sense wire connection would be good practice – that way a problem with either would only take out the local fuses and not rely on the reverse lamp fusing for protection. As you say tap both of the protected wires to the reverse lamp positive supply. That should be fine, it is after all 2/3rds as much again so should easily give you enough operational ceiling. Just one more quick one…. The existence of a plug in loom point depends on if your vehicle was pre-wire specified from new with this option, likely it has not. There are a few options open to you, universal kits like this one (19040502RC) here. The great thing is this company gives very good instruction on how to fit, see here. I don’t have exact costing for these but are most likely a great deal cheaper than the MB branded option! Thank you once again Steve for spot on advice. I have contacted the company and are sourcing the wiring and tow bar through PF Jones who they advised. The radio antenna forms part of the upper windscreen band and the connection can be found in the vicinity under the light dome up front. If its a really bad signal, there is a chance the windscreen has been replaced at some point and the cable not connected correctly – worth a look, however it is generally poor. You could use a short flexible antenna on the roof, entering under the dome lamp, then splicing the cable to the new antenna would be quite easy as its already there and would not need any threading through to the radio set. I have seen two types of connection, the first is like a spade terminal that is bonded to the glass rather like a heated window/rear window element on a car and the other is like a press stud arrangement. I will presume you have the former and it has broken off. There is not a great deal you can to to be honest – you could try a repair using epoxy resin and then clean up the deposited copper base metal on the screen element and the newly attached/glued spade. Then Purchase some Elecolit – Maplin used to sell it years ago in a little bottle along with some conductive silver paint (for repairing heated rear screens old-skool!) and build up the joint so contact is made once again. Access is a problem to carry out this wonderful repair that, after hours of work may still only result in mediocre performance – but at least as standard! Don’t spend a lot on a glass-stick on antenna, they are just better than no antenna at all – remember the great 80s innovation: ‘The Tax Disc Antenna’ Thankfully we don’t need a holder in the screen now, so we have a decent excuse not to waste our money on getting one! Have a play, try just a piece of wire you may strike it lucky. You can just tuck it under the unfinished edge of the roof liner by the screen going as far down the door pillar as you need. Interference may be a problem but no harm in experimenting. I would be tempted to choose a good quality antenna which will come with more than enough connected lead to tuck behind the headlining and down the passenger plastic window pillar. Once you are at the dash, removing the top tray and radio cage will enable you to route the new antenna cable to the back of the set. I would not splice the antenna as the inner coaxial conductor is very thin, indeed and in some cases only the thickness of a hair! Problems for the future if you do this I think. Best to run new cable and leave the old one disconnected. Certainly don’t consider connecting the two at the same time, a roof mounted antenna without amplifier will be better than you can imagine after the poor performance of the screen alternative! Here at 3.43 to remove the top tray etc. Hope this assists. If you have the HA1111 radio then the antenna is a standard affair if you have the NAG Comand with NAV then it will almost certainly be FAKRA. Adapters are available from eBay no matter what you encounter. A good Auto audio shop will be able to help you with advice if you come unstuck, they may even have the bits in stock but will probably be more expensive than online parts. This I think is the MF2830 which is FAKRA, this is the sort of adapter you will need (check its the correct one when you pull the radio, this should enable a standard antenna to interface to the FAKRA. Its all about collecting aperture, the bigger the antenna the better. You need something like a 400mm Hirschmann roof antenna, choose something with an adjustable angle and flexible enough not to break on barriers etc. Make sure it has the correct cable. Looking to do this in my ’08 vito. I am having difficulties in finding the bracket and monitor assembly, can you give me a link to the products please? Your installation will depend on what you can get hold of, the block that is glued to the windscreen is standard so pretty much any rear view mirror or bracket will adapt. A popular option is the display mounted in a rear view mirror, These directly replace the mirror and allow the display to mounted at eye level. Bay is full of them. pick the largest you can get. The monitor I had vas manufactured by Back-view and came with a slot nut slide at the back so it was quite easy to adapt a mirror arm. Sorry I cannot be more help, I am pretty sure EBay will hold all the answers! 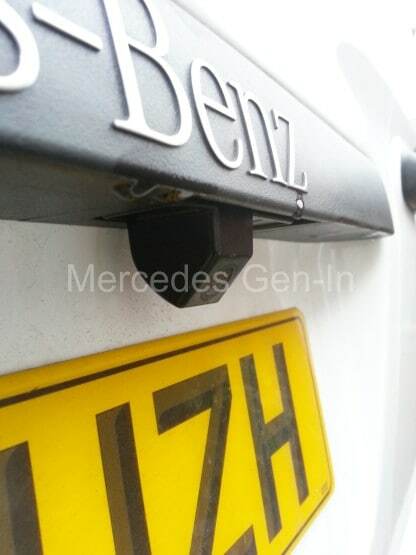 Hi James, I recently fitted a reversing camera to my vito which has a single lift up door but in place of fitting it to the number plate mount I fitted the camera to the grommet in the door that is for the rear wiper which my vehicle does not have, also in place of running wires all the way from front to rear I used one of the wireless systems which I got from banggood for £8.56 the video is perfect with no noise on the screen either during the day or night I used my radio for the screen as I had fitted one of the 7 inch models which has a input for a reversing camera and switches itself over as soon as I put the van in reverse. I do not know how they can sell radios of this standard for these prices the one I used has a DAB radio receiver built in along with navigation software which gives spoken instructions and even if you have the radio on it mutes the radio when it needs to speak and the same with the phone if my phone rings the radio mutes on its own so you do not miss a call. There is adequate light output to provide illumination, if you wished to improve things you could use led lamps as they are far brighter. Make sure you get the ones with internal resistor – Sold as CANBUS safe. This will prevent any bulb failure warning light issues. Thank you Steve, much appreciated. Mines been fitted and looks great. Decided to go down a slightly different route in the end. Instead of adding a monitor, decided to change the original stereo with one which has a reverse camera input so it’s all integrated into one unit. The only slight issue I have now is the radio reception seems weaker than with the original stereo. Been thinking this could be a problem involving the powering up of the antenna booster. Would you happen to know the wiring to Vito stereos and which wire powers up the antenna booster? Can’t seem to find the wiring diagram online anywhere. Best Regards. 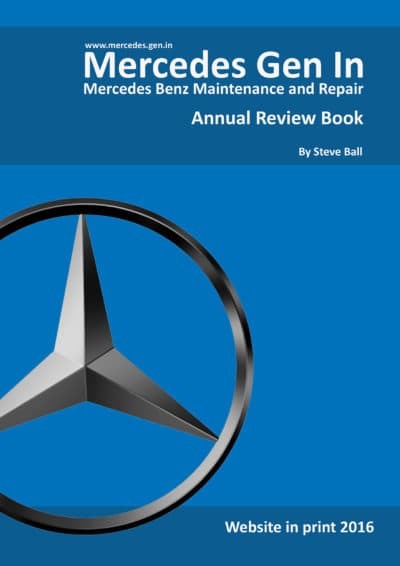 Hi Steve, on the subject of aftermarket stereos I noticed the original Mercedes stereo is fitted with two Facra connectors. One Facra is white and the other one is yellow. Do you have any advice on what the yellow facra connector does, as the aftermarket stereo only came with one Facra adaptor? In turn the yellow one has been disconnected so could this be the reason why the radio reception has suddenly dropped? Many thanks. That yellow one is the second FM antenna (one in each side glass in some models, others rear and front windows) so it will probably have some effect of the reception. You could try a lash up in joining them together to see if it works any better, then try and get hold of suitable connectors to make it more permanent. I have a feeling the white connector is antenna with ‘active power’ (in some cases) to supply DC power up the coax to an integrated antenna pre amp located remotely – so that could be a compounded issue – no power = hardly any signal, and I would doubt the aftermarket radio would be designed to power such devices out of the box. If it does not improve on FM antenna 2, yellow connection only, then you may have to rethink it. Hi Steve, thank you for the info. It seems more difficult than expected. You half expect a few minor modifications when fitting these after- market stereos, but they aren’t exactly plug and play as the sellers like you to believe when you purchase it. I had to run a new line from the canbus connector just to power the new stereo up, which is only easy when you know how and where to find the canbus wiring in the first place (mine was located in a plastic pouch under the drivers dash). 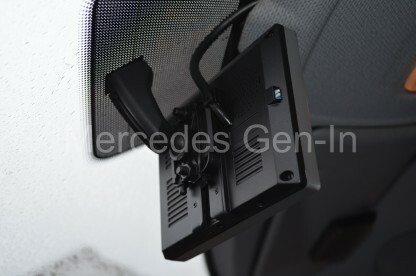 Having read up a little on the twin antenna plugs, the Mercedes oem stereos appear to be intelligent and designed to talk and switch between antennas, depending on signal strength in your location. To be honest I’m a little sceptical it’s even do-able with an aftermarket stereo to get a good all round reception on my Vito. Maybe a new external aerial is required (if I can pluck up the courage to drill a hole in my Merc!!). I also purchased a twin Fakra adaptor to connect both the white and yellow Fakra connections simultaneously. Thought it was worth a shot. I don’t know what you make of these, I’ve included a link below. Many thanks. Do let me know what you find and how it eventually all pans out. Fitting an external antenna is quite simple on the vito, select a position to mount above the dome light, cable entry and routing is made simple, running along the head lining and down the window pillar to the dash area. Often its the sealing and base components that you are paying for, along with the option of just buying a new whip section if you break it. Have a look at what Hirschmann offer, these are OEM for Mercedes Benz. Correct in the assumption that whip or roof antennas will be better than stubby types even though most have some form of amplifier in them. Rule of thumb, the bigger the antenna element the greater the signal collecting aperture. Hi great instructions most detailed by far, I’m going to attempt to wire in the reversing camera system just wonering if you could explain how I might go around tapping of the power for the monitor or what I might need to do this as I have no experience in any type of automotive electronics? Also just wondering ive purchased some 0.5mm wire rated to 11A is that sufficent to carry the load for a monitor with a 5w load? any help you could give would be apprieated. From the information you have given, almost any wire would be fine for this as the current draw is quite low, Watts = Amps x Volts so your 5 watt load at 12 volts should be only in the order of 0.14 A So a cable rated at 1.5-2.0 A would be adequate. Of course ‘what will do a lot will also do a little’ so don’t worry if you still want to use what wire you have, just make sure you protect the circuit at the point where you take the originating supply with a low value fuse perhaps 2A. Sorry its taken a time to reply been on holiday for a few days and had other duties to attend to! Someone could please advice me the best way to bring wires from the stereo player to the retrofit OEM speakers? To choose the tunnel from plywood underneath VS A pillar to C pillar option? The second choice can be done by me, I think, but for the first one, I need to go in a service… more work. Thank you!